FAQ Series: How do I download from Snap WebHost? Question: How do I download from Snap WebHost? Online survey responses saved in Snap WebHost can be downloaded and imported with a single click – there’s no need to log in to Snap WebHost to access new survey replies. 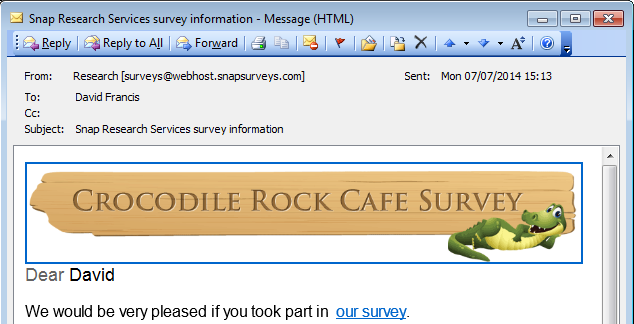 Just link your survey and Snap WebHost account, and you’ll be notified as soon as new survey data is available. Most surveys include a question grid, but how do you analyze the responses? A percent positive bar chart is the perfect way to summarize responses and quickly identify where you’re doing well, and where there is room for improvement. Our HelpDesk support team is often asked how to present results from a large dataset. We have created a helpful worksheet that explains how to create a single table combining data from four multiple-choice style survey questions. It’s essential to make email invites and reminders as attractive as possible in order to help maximize your survey response rates. Snap WebHost, Snap Surveys’ online survey management system, allows users to send email invitations and reminders to a list of respondents. 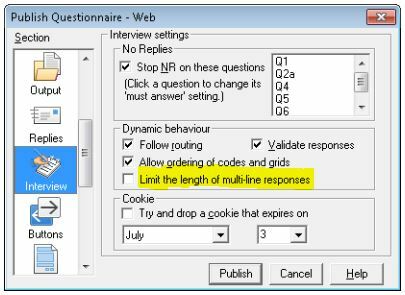 The Interview settings section enables Snap Survey Software users to control aspects of validation, routing, and mandatory questions. And new for Snap 11, users can limit the length of multi-line responses. Want to learn 14 tips to improve response rates? We’ll start with 1 – 7. The higher the response rate, the better. But getting that high response rate can be difficult. Here are seven easy tips for improving your overall survey response rates. Administer a pre-survey email. A pre-survey email can easily help warm up your respondent sample to the idea of completing your survey. Inform the sample of when they can expect to receive the survey, by what mode (online, mobile, paper, etc. ), and explain the incentives (if applicable) and the benefits of the research to the respondent. Introduce yourself. Compose a well written introduction statement at the beginning of your survey detailing the importance of respondents’ opinions, comments, and overall feedback. Learn how to use the Totalize function to add up responses as they arrive using Snap Survey Software. The amount allocated to each option gives the relative importance of each option. This gives good numeric data for data analysis, but it is quite difficult for respondents to comprehend if they cannot see their answers being totalized. We have developed a worksheet describing the easy steps you can use to implement the Totalize function in your next survey using the Snap Toolkit. The Totalize function calculates a running total as the respondent completes their answers. You can also create a valid range using the Totalize function, so that respondents cannot move to the next page if the total is over or under a certain specified valid range limit (for example, setting a valid range of 0 to 100). If you have set a limit on the total, the answers are checked against the valid range when the respondent attempts to answer the following question. If the answer is outside the range, a message is displayed. You can customize the default message text. Why conduct online surveys with survey software? Here are 5 reasons. Survey research is a valuable form of data collection for any sized business. Surveys can supply the data necessary to make informed business decisions. Whether it is conducting a consumer product survey for research & development, testing the effectiveness of your marketing campaigns, or collecting feedback about the services provided by your support staff – all results have a significant impact on strategic business decision making.